We are proud to announce that we have been awarded a coveted AA Rosette for Food Quality and culinary excellence for a number of years. Our Riverside restaurant provides a formal yet relaxing dining experience. Our team of chefs prepare the finest of meals, reflecting the best selection of fresh foods from the surrounding area. A broad selection of wines to complement the food is also available. 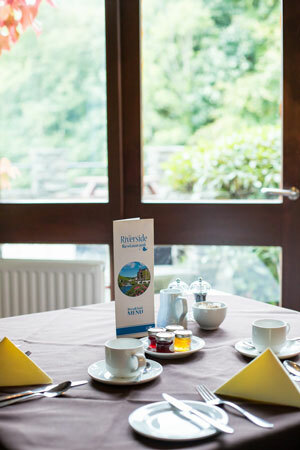 Hotel guests enjoy breakfast in the riverside restaurant and can enjoy pre-meal drinks, morning coffee or afternoon tea in the lounge. The Riverside restaurant is an ideal venue for Wedding receptions, it has been granted a licence for the performance of civil weddings. Further details on our weddings can be found here. Business luncheons are frequently held in the restaurant as part of our conference package.